What would we see if we looked back across the landscape of our lives from the vantage point of age and experience? We would observe the undulating hills and valleys of life’s darkest hours and life’s most spectacular, breath-taking highs. We would see where we went wrong, what we learned from our experiences, and how we coped with each and every trial and victory. Such was the case with Moses. Judaism holds that Moses wrote the entire Torah through God’s divine revelation and destiny. Moses saw the Garden of Eden. He beheld the patriarchs and matriarchs, and he witnessed his nation’s high points and their embarrassing lows of idolatry, doubt, and disorder. The first five books of the Bible are known as the Torah, and besides holding God’s sacred instructions to Israel, it also holds tapestries of stories—mankind’s story, our first parents’ stories, and God’s story. 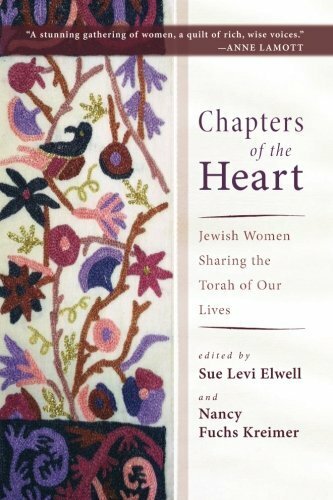 With this in mind, the subheading of Chapters of the Heart: Jewish Women Sharing the Torah of Our Lives reveals precisely the contents of this work. It is a collection of women’s stories viewed through the looking glass of hindsight and experience. Individuals do not carry a story, rather, they are a story—a collection of strands and ordered threads in a tapestry. Our very mind-sets, culture, context, family life, and upbringing uniquely fashion our narratives. This is precisely what happens in Chapters of the Heart. Women share their hearts—they share their “Torah” of experiences, culture, and context. Chapters of the Heart is one of the first collections of feminist and egalitarian stories as told by a feminine Jewish voice. These true stories range in theme from birth to death, mourning to learning, and loss to the stillness of older years. Each story is neatly arranged into four sections and each section is titled with a specific Psalm related to the overall theme of the story. This is a clever device—it encourages readers to think deeply about the Bible’s connection to everyday life experiences. There is an overarching question that whispers through these women’s stories. How can women live and apply a feminist or egalitarian worldview to the fabric of everyday life and faith? Christian egalitarians and feminists will find the same question raised at some point in their own journey of faith. And so, for Christians, I do believe that there is deep value in reading this collection of stories. Even as I sat to write this review, I was moved by an email I received documenting the plight of Jewish women in Jerusalem who are seeking to read the Torah in public at the Western Wall. Instead of being welcomed by Jewish men and women, they are ostracized, ridiculed, and arrested. The struggle for women’s inclusion, ordination, equal right to religious education, and the re-examination of biblically based texts, is vital for both Christians and Jews. This collection of stories gives the reader a glimpse into the lives of feminists and egalitarians who continue to ask these questions and live out their faith and convictions with courage. It would be an impossible task to comment on each and every individual story. However, I do want to reflect on my favorite testimony from this book. Hara Person’s story is found in chapter 2, entitled “On Raising a Son.” Her narrative, and the lessons that lie like gold within it, has stayed with me and taught me something that I hope to make a part of my own life. Before I comment on the story itself, I must first share that I have a Jewish paternal line. Although my upbringing was non-religious, I found myself in an Orthodox (strict Jewish) synagogue in my early twenties. The refinement and spiritual value I received in those years was ordained and undeniable. One of my most poignant memories was the Brit Milah (circumcision) of my rabbi’s son. I was one of the only women pushing my way through the throng of silent men to witness the circumcision procedure. It was a huge moment for me. The circumcision ceremony is where Hara Person begins her own graceful experience of rearing a son. She introduces the reader to her fears of raising a boy, due to the fact that she was brought up around girls and as a feminist, “she got girls.” However, as she stood to witness her son’s circumcision, she suddenly recognized male vulnerability. “My son’s brit milah provided one of the first lessons about boys . . . I looked around the room at the handful of men who were present and saw them grouped nervously around the mohel, their hands clasped protectively over their groins. What lay behind the male privilege I resented was male vulnerability” (12). With this line as an introduction, Hara goes on to parallel the growth and loss of male vulnerability (understood by Hara as the ability to enjoy sensitivity, to play the harp, pursue a career considered unmanly and innocent) with the biblical hero David. “The biblical image of David as a boy presents an enchanting figure. He is young, powerless, artistic, and beautiful, at one with the natural world. Set apart from his older brothers who already occupy the male world of power and might, he lives a dreamy pre-pubescent existence” (13). “Through raising my son I have come to learn that there are ways and places where men’s authentic voices are silenced as well. When men are expected to be strong and tough and solve problems and provide for those weaker than themselves, they have not been allowed to bring forward other parts of their beings. They have had to shut down/shut off their vulnerable sides and mask their feelings. To do otherwise is dangerous. It was only in the last years of my father’s life, and due in large part to the experience of parenting my son that I was able to understand how true this was for my father. Born into poverty and instability, he worked hard his whole life, creating a stable existence for his family. Though he loved musical theatre and visual art, he was never able to give voice to those other sides of himself in a serious way, focusing instead on carrying the weight of protecting and caring for those around him through his work as a provider. After joining Saul’s army, David never again takes up music. He closes down that side of himself as he toughens up” (17). One of my reservations about this work is the secular nature of many of the stories. Aspects of holiness and the basic foundational beliefs and ethics that guide many Christian lives, even those found in the Old Testament, are excluded for a greater and more secular worldview. Personally, this was something I found hard to swallow, and it may prove challenging for other readers. However, I determined to see these works as other people’s journeys, not my own. With that in mind, I navigated their narratives. All in all, I believe this book has tremendous value. The “Torah” of these Jewish women is profound, organic, and wise. I hope it will be a starting block, and not a finishing line for women who long to confidently share their own stories through a feminist and egalitarian faith lens. Presenting our own stories as women is a gift we give to the generations that follow us. Our experiences can and do inspire and encourage those who are struggling with their own questions about faith and equality. To quote Kathe Kollowitz’s words in introduction of this book, “what would happen if a woman told the truth about her life?” This book answers that question. It is a powerful encouragement to other women seeking to tell the truth about their own lives. It's A Girl! Now What?